Ivan Turgenev, On the Eve (1860). One of my current reading projects is to catch up on Turgenev, whose work was enormously influential on Meiji Japan. This novel, for example, is cited repeatedly in Tayama Katai’s “Futon” (1907), a landmark in modern Japanese fiction. I can see the attraction On the Eve held for Japanese writers: the bold and beautiful heroine Elena, the lamentations over the weakness of Russian men (the hero is a foreigner, a dashing Bulgarian nationalist eager to die for his country), and the wry social commentary that dots the narrative. The story ends rather mysteriously, though there is a suggestion of hope in the air, as the work’s title suggests. I read the classic Constance Garnett translation, first published in the 1890s: it’s probably the same version that Tayama Katai knew. Rabindranath Tagore, The Home and the World (1916). Tagore’s another writer I’m catching up with, in part because I’m interested in reading him alongside his contemporary, Natsume Soseki. This one contains many Soseki-like themes: multiple narrating voices, a love triangle in which two men compete for the same woman, disputes over family property accompanied by fears of treachery and theft, with all of this personal drama played out against a social field of dramatic change and discontinuity. Tagore’s understanding of the double-edged erotics of nationalist passion is prescient: here, the desire for fraternity can shift registers in an instant to become bloodthirsty rage. The translation (by the author’s nephew, with close attention from Tagore himself) feels creaky in places, but that might say more about my limitations as a reader of Bengali fiction than it does about Tagore’s talents as a novelist. If you’re interested in this book, by the way, you should catch “Last Harvest: Paintings of Rabindranath Tagore,” a fine exhibit of Tagore’s visual art from the 1920s and 30s, on now at the Art Institute of Chicago through April 15, 2012. Karl Marlantes, Matterhorn (2010). My father died in late 2010; this was the last book he read. Frustrated for years by a brain injury that impaired his memory and mobility, Dad had a hard time following complicated narratives, but this epic novel of the Vietnam War cut straight through the cognitive fog to reawaken the passionate reader in my father. He devoured this repeatedly in the last months of his life and it was all he wanted to talk about. Dad had a lifelong connection to the military stretching from the late 1950s, when he enlisted as a teenager in the Minnesota National Guard and then the U.S. Army, to his retirement from the Veterans Administration in the late 1990s, where he counseled ex-soldiers suffering from PTSD. In other words, he’d lived his life alongside the sort of people depicted in the novel, even though Dad never served in Vietnam. I’m about halfway through the book now. In some ways a conventional war narrative (we accompany a heterogeneous group of soldiers through a series of increasingly dangerous missions, each member of the band representing a different socioeconomic, ethnic, and regional type), it is a gripping narrative, its impact aided by the knowledge that it is based on the author’s own experiences in the war. Comments Off on You Still There? Greetings from Shinjuku, Tokyo. I arrived in Japan two days ago for a workshop at Waseda University. After that ends, I’ll hang around for another week or so, doing a bit of research, a bit of visiting family, and a bit of music spectating (more on that later). In the meanwhile, I’m reminded of how Shimazaki Komako (1892-1979) had a way of surprising people by turning up when least expected. She was the model for the heroine in Shimazaki Toson’s scandalous 1919 novel Shinsei (New Life), in which the middle-aged novelist confessed to a shocking affair with his own niece. She gave birth to his child, after which her family shipped her off to colonial Taiwan to avoid the scandal. Toson probably thought she was out of his life for good at that point. But she suddenly reemerged in 1937 when she fell seriously ill and, lacking any financial resources, ended up hospitalized in a charity ward. The media had a field day, dredging up the old scandal and contrasting Komako’s current plight to her uncle’s wealth and fame. 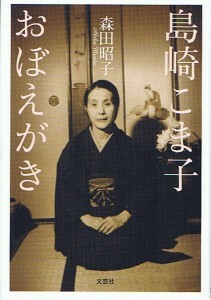 Novelist Hayashi Fumiko took an interest in her at the time and wrote about her, and Komako herself ended up publishing an account of her life in a popular woman’s magazine, taking her uncle to task for the hypocritical way he had portrayed her and their relationship in the novel. I wrote about all of this at some length in my book, The Dawn That Never Comes. I was under the impression that, once I’d published my account, Komako was out of my life. But she wasn’t done with me, apparently. On the plane ride to Japan, I started reading the recently deceased Inoue Hisashi’s 2002 play, Taiko tataite, fue fuite 『太鼓たたいて笛ふいて』(Bang the drums, blow the pipes), a kind of Brechtian musical based on the life of Hayashi Fumiko, tracing her collaboration with Japanese militarism in the 1930s and her eventual self-critical awakening in the 1940s. Inoue has Komako appear as a key character: he re-imagines the nature of their relationship, having the two women meet in 1935, prior to Komako’s illness, when she was still an activist in leftist political movements. In Inoue’s script, Komako becomes a figure for the conscience of Japan as Hayashi slides into problematic complicity with fascism. Inoue’s play was first staged just about the time time I finished writing my book. I’d thought I was the only person fascinated by Komako when I wrote about her. But according to the afterword in the Shincho Bunko edition of the play that I’m reading, Inoue had been thinking about her for years: in 1969, he submitted a scenario for NHK’s morning serial drama based on Komako’s life, only to have it rejected for being too dark in tone. Where do you suppose she will turn up next?